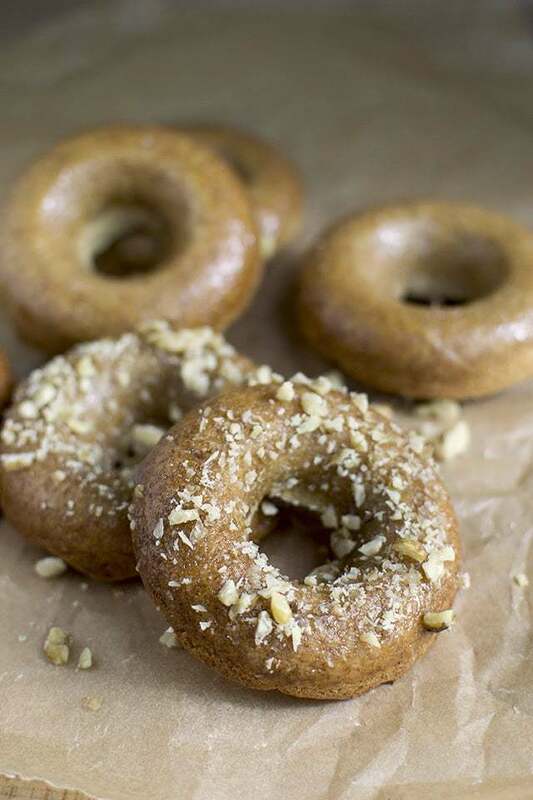 Baked Maple Doughnuts to celebrate National Doughnut day. These doughnuts are baked instead of fried, which makes them little less-guilty than eating the traditional ones. Preheat oven to 375°F. Lightly grease a 6 cavity donut pan with cooking spray. In a medium bowl, combine flour, potato flour (if using), baking powder and salt. Whisk well. In another mixing bowl, whisk maple syrup, egg replacer mixture (or egg), vegetable oil and maple flavor (if using). Pour the wet ingredients onto dry ingredients and mix until combined. Divide the batter evenly in the prepared pan. Bake for 12~14 minutes or until a cake tester inserted into the center comes out clean. Donuts should spring back when touched lightly and the tops will be lightly golden. Let the donuts cool in the pan for a few minutes before removing them onto the cooling rack. In the meantime, combine the glaze ingredients in a microwave safe bowl and microwave it for 30 seconds. While the donuts are still warm, dip them in the glaze. Sprinkle the crushed walnuts and allow to cool completely.